New Delhi, July 22 (IANS) Having finished seventh in the last edition of the Women’s World Cup, India will fancy their chances of emerging champions of this edition when they face England in the final at Lord’s in front of a sellout crowd here on Sunday. In retrospect, where India played the final of the 2005 World Cup against Australia, Sunday marks a big day again for the team with better in form performers swaying their best foot forward. While the stands are already full with all tickets sold out, 50 million people would be watching out the match, having the experience of big match situation for the girls. 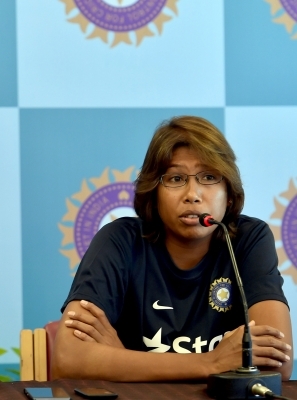 On the other hand, Jhulan Goswami will have a chance to create history by becoming the first Indian woman to reach 1000 runs and 100 wickets as she is just 4 runs short of the target. Harmanpreet Kaur has already registered the second highest One-Day International (ODI) innings for India when she scored an unbeaten 171 against Australia in the semi-finals. Deepti Sharma had already scored 188 against Ireland at Senwes Park in May 2017. In the last 12 months the team was gelling up well. It has a right balance of youth experience and raw aggression that is visible in all three departments — batting, bowling and fielding. The Indian eves will have to keep in mind five crucial points in order to etch their names in history of the women’s World Cup. Firstly, with the best spinners in form having delivered in a place where swing and seam thrives, India’s Deepti Sharma registered an excellent bowling performance taking three wickets in 8.3 overs while conceeding 47 runs. Secondly, in the league match against England, India had their tails up especially when setting targets, where Smriti Mandhana, Poonam Raut and Mithali Raj posted a total of 247 in a victory against England. Thirdly, India’s rotation in players is emerging to lead the charge towards victory. In a gradual process staring off with Mandhana and Raut shifting to Mithali, Ekta Bisht and Rajeshwari and now the focus is successfully on Harmanpreet Kaur that seems to be the right action at the right time. Fourth ought to be the current performance of Mandhana and Mithali that resembles Kapil Dev’s performance that lifted the Indian spirits in 1983. Lastly, the Indians have peaked at the right time. With more aggression in body language, starts, slides, dives and even conversion of half chances into run outs. Where each of India’s top three batters have posted centuries so far in the tournament and with left-arm spinners claiming regular wickets, England’s Nat Sciver has the ability to turn the match upside down having scored two centuries in their matches against New Zealand and Pakistan. The three-time World Cup Champions will be posing a tough challenge against India, the 2017 World Cup is already witnessing an interesting pattern of Australia defeating India, India defeating England and Australia in group match and semis, respectively, while India again eyeing victory over England on Sunday.